If I Were a Season, I’d be Monsoon. About this post: For a long time, I ran away from the monsoon in India. I had no idea how beautiful the rainy season could be, how rejuvenating monsoon travel could be. After years of fleeing the monsoon in India, I now chase it with all my heart. This season, I’ve collaborated with Radisson Rewards to seek memorable monsoon moments across the country and can’t wait to share them with you! I lie on my back, floating alone in the pool, soft raindrops gently falling on my face. Palm trees rustle in the breeze. A peacock cries in the distance. Grey clouds move swiftly through the sky. I close my eyes and deeply inhale the heavy monsoon air, thinking that maybe, the clouds are erupting just to indulge me. Over the last three months, I discovered the trendy city of Copenhagen on a bicycle, set sail to Bornholm – the furthest island in Denmark, slowed down on the shores of Lake Atitlan in Guatemala, lost myself on the cobblestoned streets of colorful Havana, joined a coral reef restoration project on Cocodrilo – a remote island in Cuba, sampled legal stuff in the Bay Area 😉 and hung out on the Pacific Coast of California. When it was time to pick my next destination, I could feel the tug of the Indian monsoon calling me to my home country. I’ve come to believe that nowhere else in the world does the rainy season like India. Not Cuba, not Guatemala, not Southeast Asia. The rains in India are laden with an indescribable feeling of joy. The earth bursts into shades of green, the aroma of pakoras waft out of every house, the immense relief from the hot summer is visible on every face. But even heading back to India, I felt torn. On one hand, I wanted to slow down and drive my bike along the lush rice paddies of Goa and on the other, I wanted to experience the joy of rain in the desert terrain of Rajasthan. 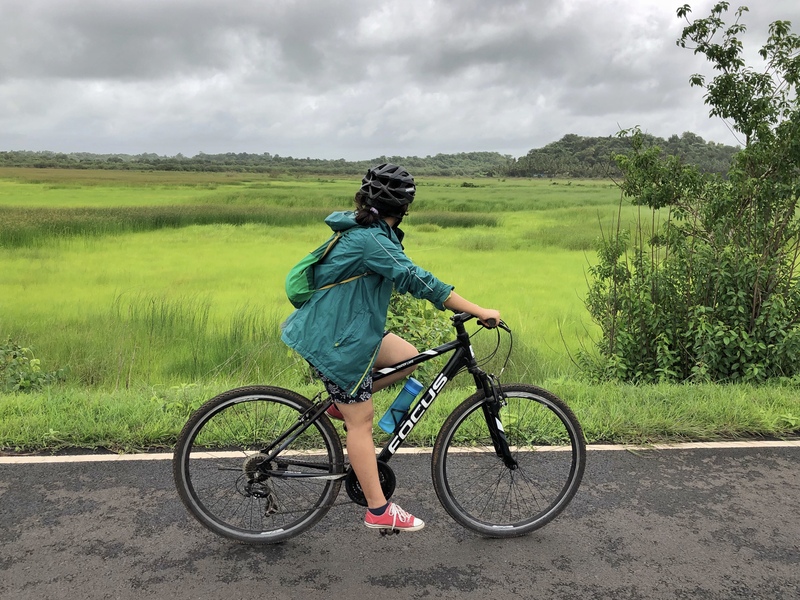 I wanted as much to hang out at my favorite Mumbai cafes while it poured outside, as I wanted to walk along the furious sea waves on the Konkan coast. Inspired by the rains in Guatemala! Luckily for me, I didn’t have to choose! In collaboration with Radisson Rewards, I’ll spend the next couple of weeks exploring some beautiful corners of India, sampling new cuisines and familiar flavours, revelling in the rains, seeking memorable moments that make India incredible. Along the way, I hope to introduce my parents to the Goa feeling, indulge in the royal ways of Jodhpur, sample city life in Mumbai and wash up on a quiet corner of Alibaug. Along the way, I hope to get drenched in the lashing rain, inhale the moisture-heavy breeze and fill my lungs with the smell of wet earth. For this is the feeling I came back eagerly to chase. This is my season. The season I’d be if I were a season. Join my journey through the rest of August on social media with #memorablemoments and #wonderfullyrewarding, as I explore India, indulge in the Radisson experience and chase the rains. If you have any interesting, offbeat suggestions for Goa, Jodhpur, Alibaug or Mumbai, I’d love to hear them! *Note: I wrote this post as part of the Radisson Rewards campaign by Radisson Hotels Group. As you know, opinions on this blog are always mine. Join my adventures live on Instagram, Twitter and Facebook! looking forward to the monsoon posts. Yes…it’a beautiful season. I too love it. But this time, I am sad as Kerala is flooding owing to the torrential downpour..
Like always, your post is inspirational…. I love this post because you’ve beautifully captured the essence of monsoons. Last year around this time, my friends and I decided to travel to Goa for a few days during the monsoons. A lot of people said it was a bad idea, but it turned out to be one beautiful trip! Thanks Reema; writing this felt so nostalgic! Glad you enjoyed monsoon travel too. This is an interesting post and like most of your posts, very thought provoking, very much not thinking inside the box. I never thought of what season I would be if I were a season. Given all the destruction that monsoons create , I would think that’s one season that you WOULDN’T want to be. If I were to choose one season, it would be winter definitely . As you describe the feeling that you get from the rain coming down, I feel the same way when the first snowflakes fall. It’s beautiful and winter time, not too many people travel to the areas that I go to. Unfortunately it’s not the season that causes destruction, it’s the way man meddles with it. Yes, and unfortunately a lot of politicians here in the United States who really should know better but don’t , think that climate change and global warming are “fake news”. Hi Shivya I am glad the pitter patter of rains draw you back to India. And the cafes in Bombay are definitely waiting for you. I like that question with which you end this wonderful piece. If I were a season it would be summer.I am a complete sun worshipper and it is for me the perfect time of the year… Glorious, radiant, bountiful! Wow! I’m heading to Goa in 2 days and when I read you’re here all the way from your world journeies I can’t stop myself from asking you if there’s a little chance of meeting you. That one sentence, there’s no other place but India when it comes to monsoon is so so true!!! Makes us forget everything else which may annoy us about our cities and just want us to smell the rain and be blissful. I have a similar distaste for monsoons which may change now after this. Thank you for writing, was a treat to read. Exactly, and that’s a win-win! Eager to share my journey too, lots of updates on Instagram already. Really a season that attacts me to the nature as I love monsoon, this time I wanted to go to Kerala but all cancelled I am searching for a new place to roam. Sad what’s happening in Kerala. Try Odisha maybe! Your post made me like the monsoon season as it obviously makes everything more charming, Shivya. Thanks for the eye-opening post! Glad to hear that; hope you’re experiencing the beauty somewhere yourself! If someone denies its desire to get wet in the rain, probably he/she is lying. A little kid in us who is lost in ages of maturity suddenly pops out when it sees tiny droplets falling on to the earth. If I were to be a season, I would be Spring. I love little warmth in the air, beautiful colors of leaves and flowers. Faint whiff of various flowers blooming. If it rains, like summer showers, it’s absolutely a blissful feeling. I somehow feel a bit low at the grey sky and torrential monsoon rains. If I am warm inside with a coffee in my hand peering through the window, then I love monsoons, otherwise Spring spring baby! I love the life you are living Shivya! I am sure it has its downsides but wow! What a way to live! beautifull pics shivya ji , ho ske to aur bhi post share krna monsoon se related. If I were a Season then I would also be Monsoon because me too loves the monsoon of India. The pictures you posted are beautiful 💛💛 and yeah….I would choose to be monsoon too! I think every writer and adventurer wud agree to that!!! You have written this so beautifully! Previous PostBest Places for Stargazing and Meteor Showers in India. Next PostMy Journey From the Cubicle to a Nomadic Life – Now in a Book!